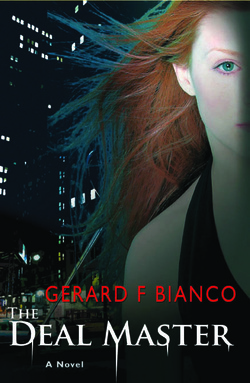 Gerard Bianco is the author of the award-winning mystery/thriller THE DEAL MASTER. His latest book, DISCIPLINE: A PLAY (2012) has recently won the Editor's Choice Award. He is a contributing author in the Now Write Mysteries Book and he was featured in Carol Hoenig's book THE AUTHOR’S GUIDE TO PLANNING BOOK EVENTS. He holds degrees in art and creative writing from the University of Southern Maine. He is an author, a playwright, a jewelry designer and an artist. He lives in Maine. In New York City, women with red hair are being brutally murdered. Detective William Gillette and his team are on the case, but they remain clueless until a curious stranger proposes a series of tempting deals - an exchange of sorts - that will help solve the crimes. Gillette accepts the offer and plunges into the game. One deal after the next, he draws closer to the killer, but each deal comes with a price. Soon, the detective finds himself in a dark hole - one he can't get out of without striking the ultimate deal. Is the Deal Master Gillette's savior, or his worst nightmare? The Deal Master grabs you and takes you for a haunting ride, twisting and turning beyond murder and betrayal, past seduction and desire, and straight through to its shocking ending. Author Gerard Bianco breaks through the barrier of the traditional suspense tale and plunges into the realm of thriller-chiller. Meet Harold Jenkins, a sexually frustrated man. Essentially isolated in his New York City apartment, he is helpless against the powers that control his every hour. He’s stuck in a rut of old habits, and that’s making things difficult with Lilly, his less-than-generous lady love. But for Harold, new possibilities arrive in the appearance of a mysterious stranger. He can’t quite figure out how to respond to this strange person he finds sniffling on his stove in the middle of the night. Bewildered and confused, Harold is faced with a critical decision: will he succumb to the requirements dictated by the powers that be, or will he take control of his life in the only way he knows how? Harold has no problems taking matters into his own hands—and that’s part of the problem. Discipline is a madcap comedy with a sympathetic mix of wit, banter, love, and frustration that flirts with the obsessions that can drive a man to madness.